It's time to start using Google Web App (GWA)! Here's how to migrate your contacts from Thunderbird. It takes some time though, so it may only be worth doing if you have a lot of contacts. Otherwise, you might prefer to just re-create your contacts in Google Apps. This guide shows how to export contacts from Thunderbird v52 and then import them into the Google Web App. 1. Login to Thunderbird, click the Address Book button, and select the desired personal address book. Please check to make sure there are no email addresses or names with quotation marks around them. If so, delete or edit them. Note: If you use lists in Thunderbird, export each list separately as opposed to the entire address book. Each list will be imported into Google Contacts one at time to help keep the emails grouped together (see Import instructions below). 2. Under the Tools menu, select Export. 3. Select location, type filename, and save as type "Comma Separated (*.csv)". 4. Open the saved file with Excel. 5. Clean up any oddities that may have been created by the export. If you use a different version of Thunderbird, you may have to rename columnn headers so the data will be properly imported into GWA. 7. 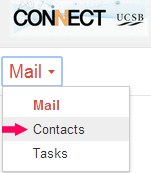 Login to the Google Web App (GWA) and click on Contacts under the Mail drop-down menu in the upper left corner. 9. In the Import contacts window, click Choose File. 10. Select the contacts file that you created using Thunderbird. Click Open. 12. Your My Contacts folder now contains the imported contacts. 13. 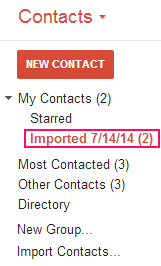 In the list under Contacts, you will now see a new contact group called Imported, with its import date and number of contacts. 14. If you want GWA to find potential duplicate entries and merge them, select the Imported folder and click on Find & merge duplicates at the top of the Contacts window. 15. It will present you with a list of possible duplicate contacts as well as individual contacts with duplicate data. For all contacts that you know are not duplicates, uncheck the box next to them. Click Merge. 16. 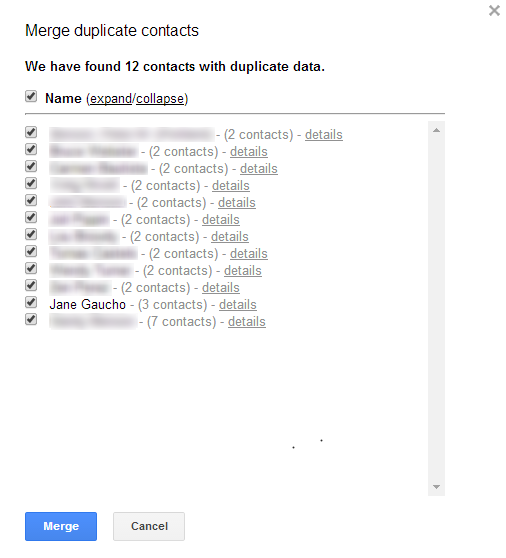 If there are duplicates, GWA will merge them and report that "The contacts were merged successfully." If there are no duplicates, you will see the following notification. 17. Note: If you have imported separate lists from Thunderbird, rename the group after each import: select it and, under the More menu, select Rename group). This way you can keep track of which lists you've already imported. 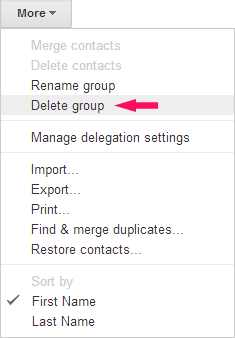 If you want to delete the Imported group, select it and, under the More menu, select Delete group. Click OK. This will not delete the imported contacts, only the new group. 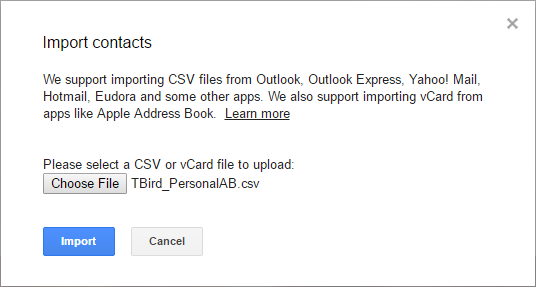 Your Thunderbird contacts will now be in Google Apps Contacts!